Make no mistake about it, California had a brutal winter in 2017. Between a record rainfall, mudslides and a late season snow it was definitely a challenge for many mountain communities. And unfortunately there were a few fatalities, such as the loss of the Pioneer Cabin “tunnel tree” at Calaveras Big Trees State Park (www.parks.ca.gov/?page_id=551). Sadly this giant sequoia was uprooted during a torrential downpour late last winter; however after a massive cleanup effort the grove recently reopened traffic around the fallen giant. Granted the forest won’t be the same without this iconic tree, however this Northern California state park is still worth a visit for a very accessible and intimate look at the remaining giant sequoias. Although the giant trees are scattered through the park, the North Grove has the most accessible concentration of them. Plus it’s easy to find, as it’s close to the park entrance. Accessible parking is located near the visitor center, which offers barrier-free access and features a collection of interpretive exhibits. 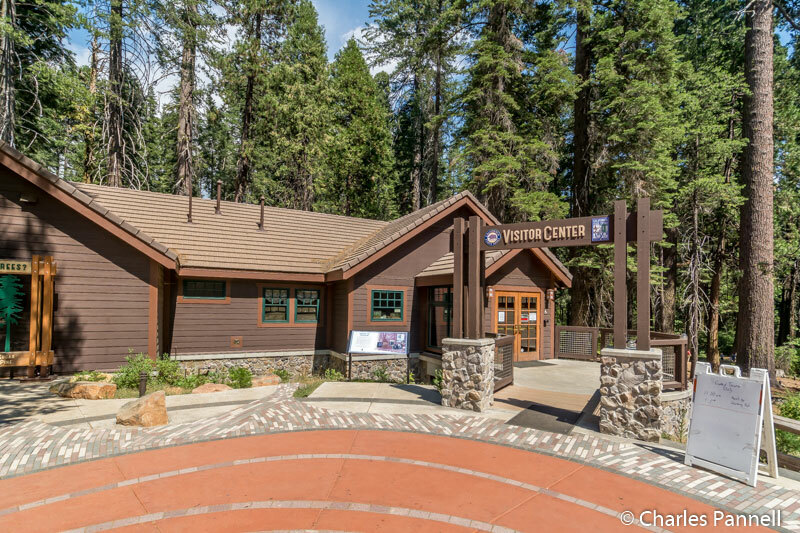 Accessible restrooms with flush toilets — a rare commodity in the park — are located next to the visitor center. The trail to the North Grove begins to the left of the visitor center. 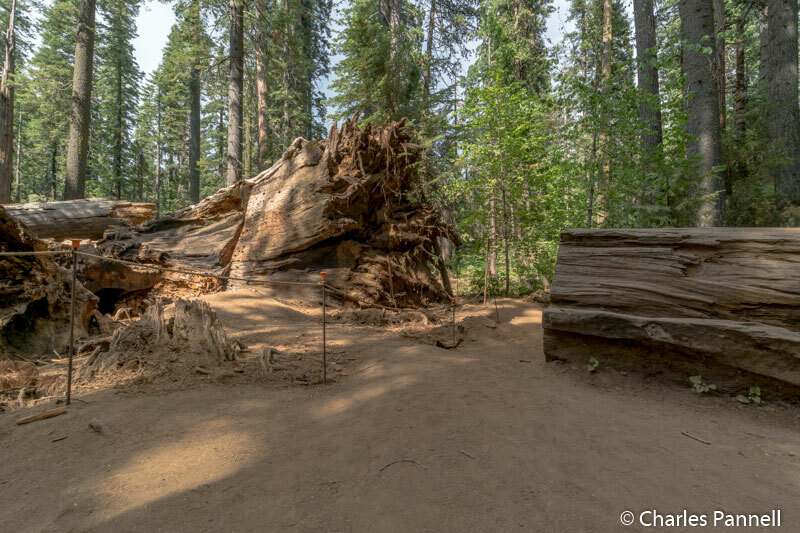 This hard-packed dirt tail winds around to the right to the Discovery Stump, the official beginning of the grove. 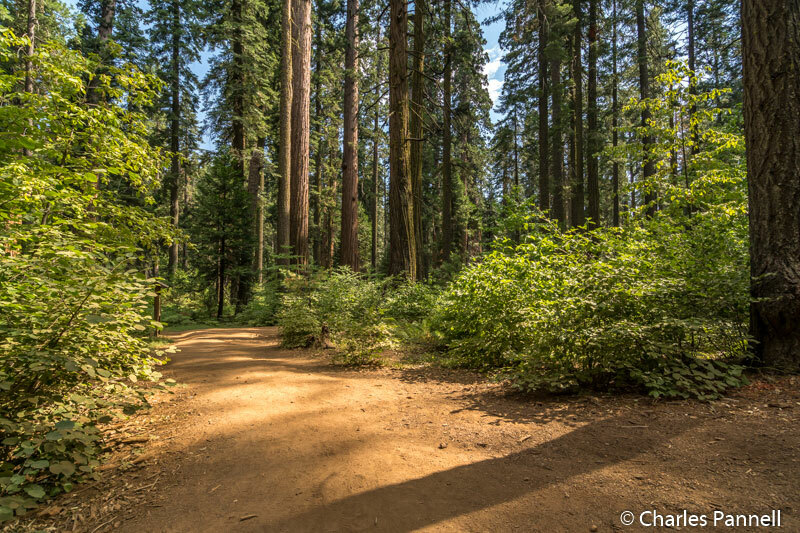 This was the site of the first tree that Augustus T. Dowd found in 1852 while he was chasing a wounded grizzly bear, and discovered this grove of giant sequoias. Sadly the tree was felled in 1853, and remnants of it can still be found next to the stump. The Three Senses Trail — which is located just past the Discovery Stump on the left — is also worth a stop. 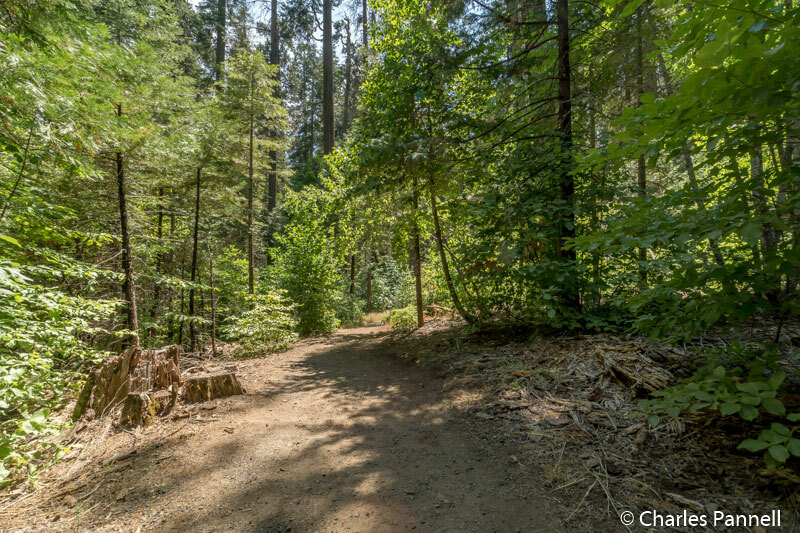 This .13-mile hard-packed dirt trail features interpretive plaques about the native vegetation, and includes benches to sit and rest along the way. And although the trail saw a hard winter, it’s still in pretty good shape, with a few bumps here and there. It’s just a short hop, but most folks pass it right by, which also makes it a nice place to dodge the crowds. The hard-packed dirt North Grove Trail, continues past the Three Senses Trail, and winds past the Empire Tree, the Old Bachelor, the Mother-of-the-Forest and the Father-of-the-Forest. At times the dirt transitions to a level boardwalk, as this 1.7-mile trail snakes past the named and unnamed giants. Just past the Abraham Lincoln Tree, the trail narrows to about three feet, where a tree fell across the former trail. The trail also makes a slight detour through the remains of the Pioneer Cabin Tree that was uprooted during a particularly wet January storm. The path is certainly doable for wheelchair-users and slow walkers, and part of the site is roped off to keep people off the downed tree. The tree will remain on the ground to provide nourishment to new trees, and continue the forest cycle. Save some time to head towards the South Grove, where you’ll find fewer visitors and the nicely accessible Beaver Creek Trail. It’s easy to find, as it’s near the end of the Walter W. Smith Memorial Parkway, about twenty minutes from the entrance station. As an added bonus it’s a beautiful drive through the park. Accessible parking is located near the accessible vault toilet, and there’s level access over to several accessible picnic tables shaded by the surrounding forest. The .7-mile Beaver Creek Trail begins behind the vault toilet. 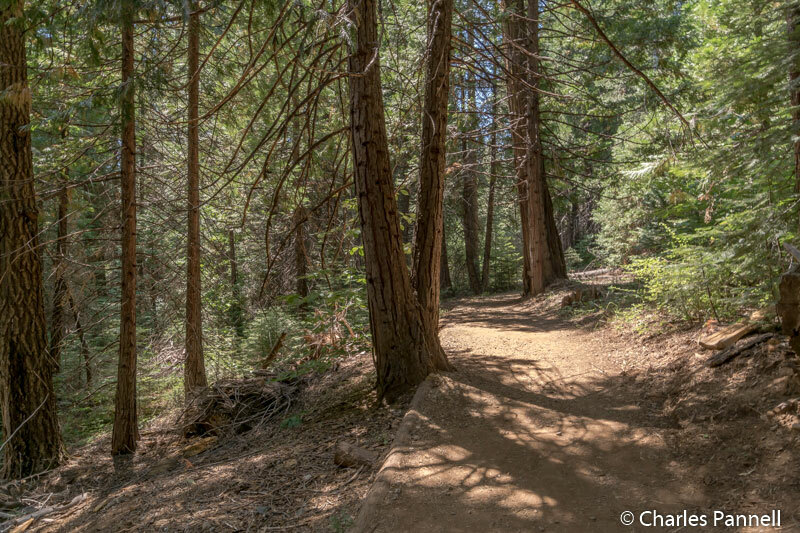 This hard-packed dirt trail follows Beaver Creek, then passes the South Grove parking area, before it loops back to the Beaver Creek picnic area. Alternatively you can begin this trail in the South Grove parking area and loop back there. Make sure and stop at Beaver Creek along the trail, which is just .1 mile from the Beaver Creek picnic area. Not only are there some more picnic tables near the creek, but beach mats allow for access right up to the water. And if you’re not there on a Creek Critter day (a popular kid’s ranger program) it’s also pretty quiet. 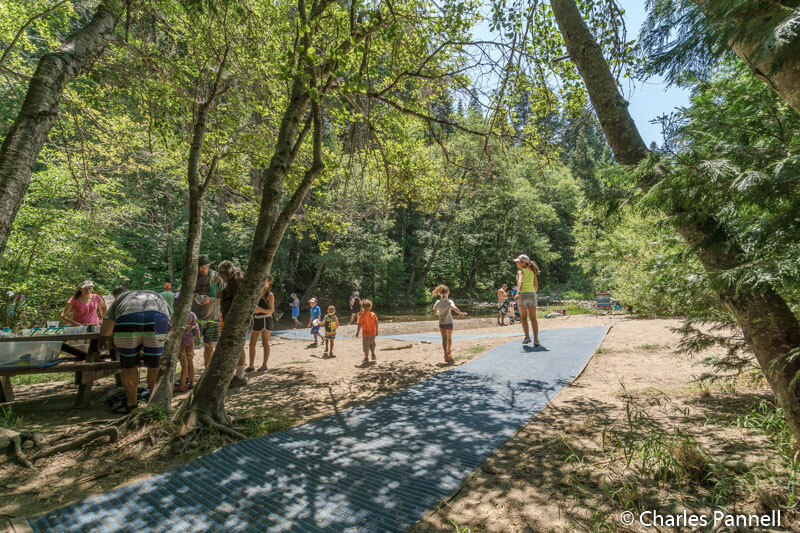 If you want to try a more challenging — yet still accessible — trail, then head on over to the River picnic area, located about halfway between the Beaver Creek picnic area and the entrance station. 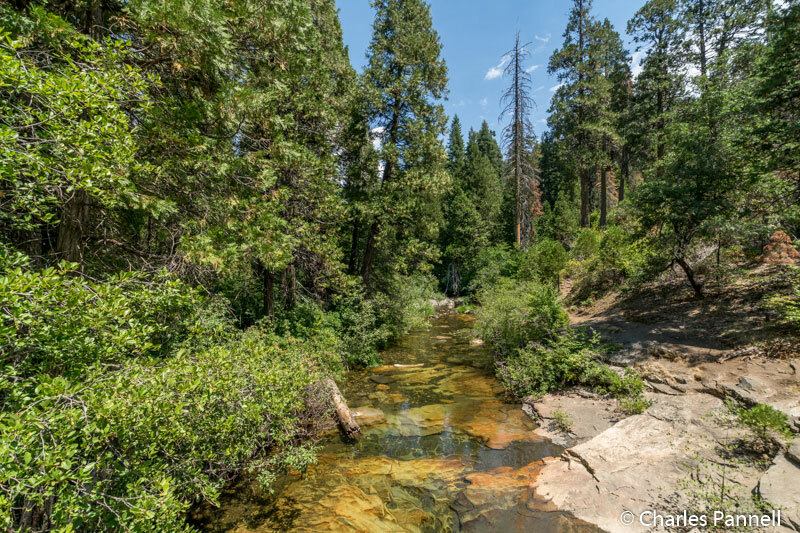 To find the Stanislaus River Trail, go all the way to the end of the second loop, and look for the accessible parking spaces. The trailhead to this .25-mile hard-packed dirt trail is is next to the parking area. The trail winds downhill to the river, however it still maintains an accessible grade. Make sure and take a good look at the trail in the beginning though, as it’s not flat, and you will have to make your way back up to the parking area. At the end of the trail there’s one lone picnic table, but you have to traverse over a small patch of sand to access it. Most manual wheelchair-users will need a bit of assistance over the sand, but you can still get a nice gander at the river from the end of the trail. It’s also pretty secluded and not frequented by a lot of park visitors. Granted this trail won’t work for everyone, but if you fancy a little workout it’s just what the doctor ordered. If you’d like to spend the night in the park, four rustic cabins are located on the other side of Highway 4, just a short drive from the entrance station. 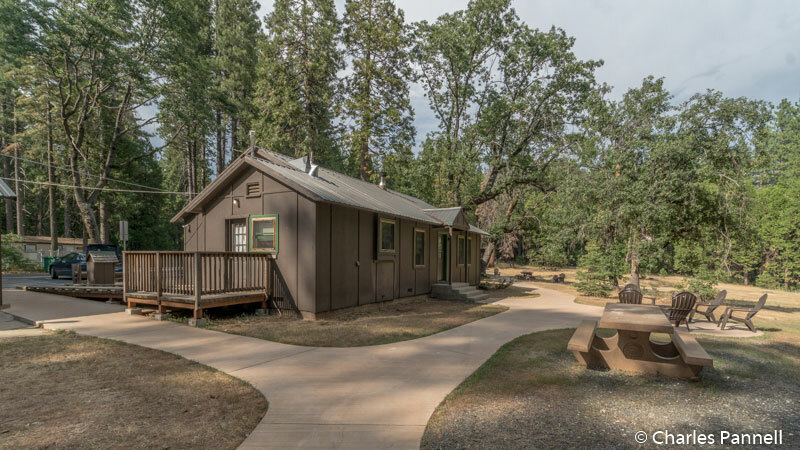 Although the Ponderosa Cabin is described as ADA accessible, because of the bathroom configuration, it’s really only a doable option for part-time wheelchair- or scooter-users, or slow walkers. On the plus side, it’s a very roomy cabin with wood floors and wide doorways, and there’s more than ample room for even the largest scooter; so if you can manage the bathroom configuration it might just work for you. Accessible parking is available in a level paved area in front of the cabin, with ramp access up to the front door. The small service porch houses a large side-by-side refrigerator, and the placement allows for a wheelchair-accessible path through the adjacent kitchen. 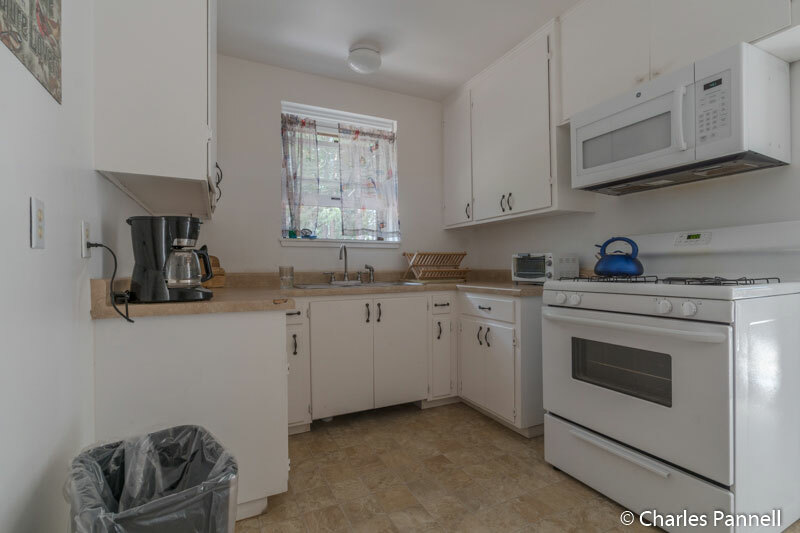 The kitchen is nicely stocked with a stove, microwave, coffee maker, toaster oven and plenty of pots, pans, cups and utensils. 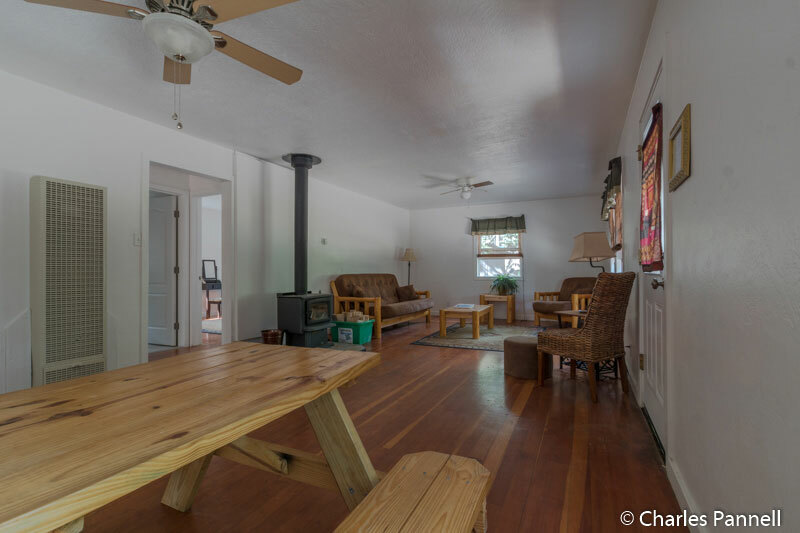 The great room is furnished with a picnic table with attached benches, a futon, a coffee table and two chairs. There’s also a wood stove — and a supply of wood — for those chilly mornings. 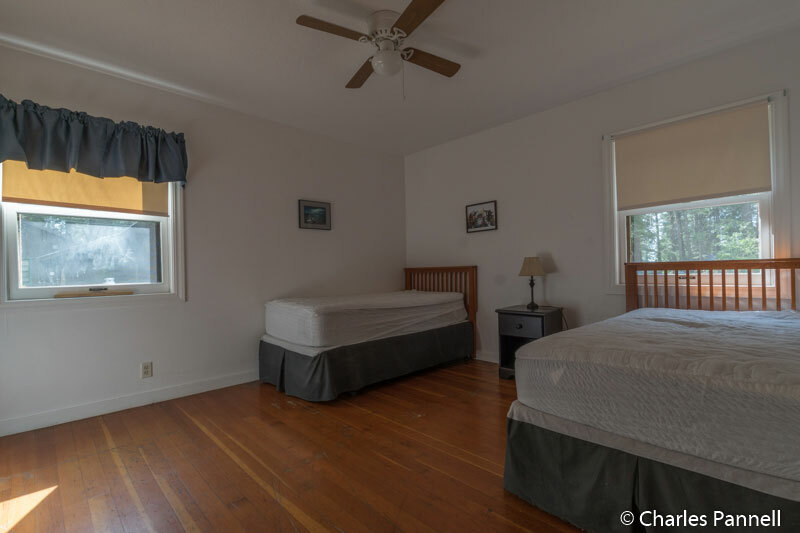 The larger of the two bedrooms is furnished with a 27-inch queen-sized bed with wheelchair access on the left side (as you face it), and plenty of room to park a large scooter or wheelchair. 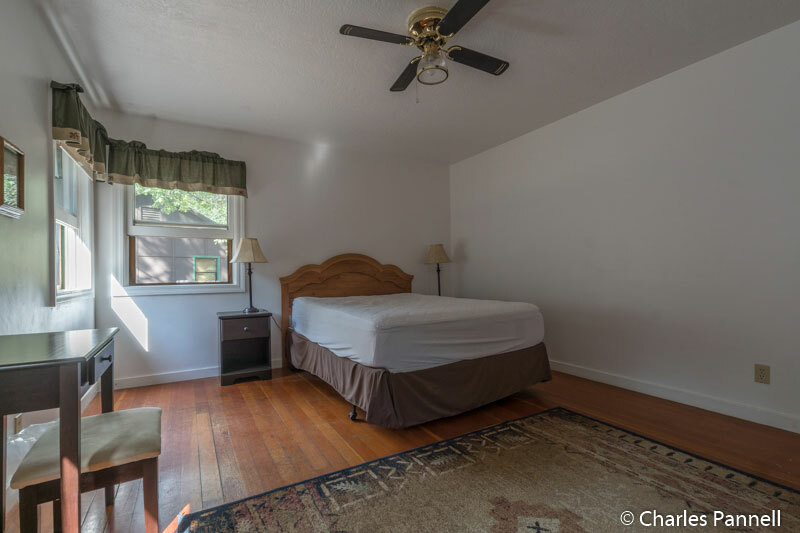 The second bedroom has two 24-inch high twin beds with a large access aisle between them. 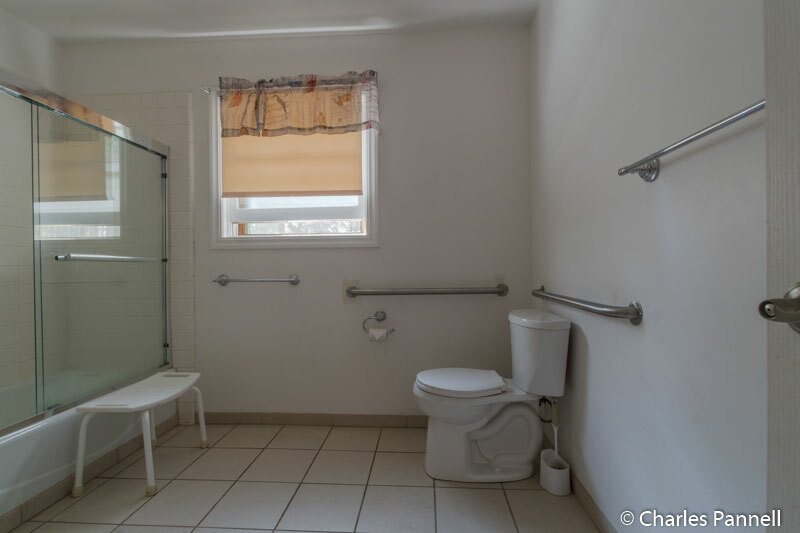 The spacious bathroom has a full five-foot turning radius, a roll-under sink and a toilet with grab bars on the back and right walls (as seated). The problem for some people will come with the tub. 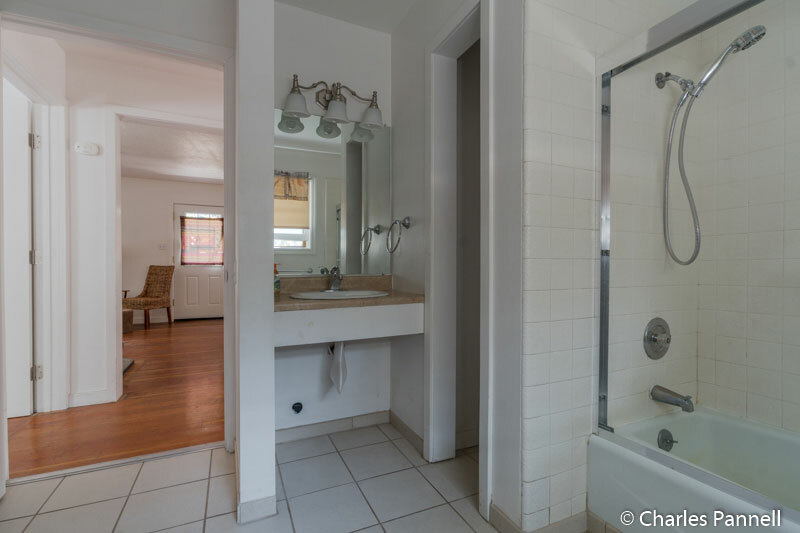 First off it’s a small standard tub with a sliding glass door and no grab bars. A small plastic shower bench is available and although the hand-held shower is removable, there is no pole to lower it to wheelchair height. 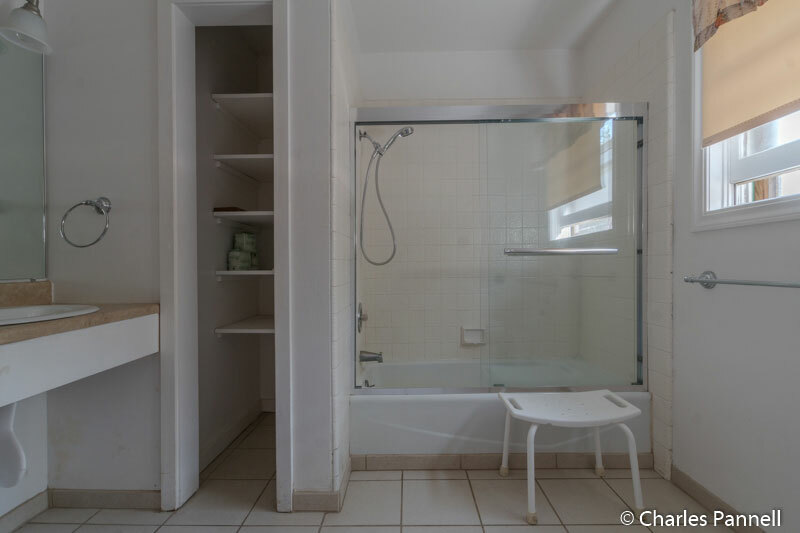 Because of the glass door, you need to be able to walk a few steps and pivot to transfer to the tub. And without grab bars, you also need to have good balance. That said, if you can pass on a shower for the night, the rest of the cabin is nicely accessible. The back door has several steps down, but there is a level paved walkway from the front to the fire ring on the back patio. It’s a pleasant area, and although it’s not fenced, it’s designated for the Ponderosa Cabin, There’s also an accessible picnic table on the grass next to the fire ring. All in all, it’s really a nice accessible outdoor space. And since there are only four cabins in the area, and the host is at the end of the dead-end street, it’s also pretty quiet in this little enclave. It should be noted that this is a rustic cabin, and you need to provide your own bedding, towels and toiletries. It’s also a good idea to throw in a kitchen towel. Reservations can be made at www.reservecalifornia.com, and although the cabin is available year-round, expect to find snow there in the winter. Be forewarned though, you need an accessible parking placard or a disabled license plate to make a reservation at this cabin, and the rangers at the entrance station are very proactive about this requirement. In the end, if it meets your needs, the Ponderosa Cabin is a very comfortable — and quiet — place to stay.